Even before the release of the collaborative Childish Gambino adidas shoes has been confirmed, Donald Glover is sharing the unreleased sneakers with fans at Coachella. Receiving an AirDrop with an Apple device relies on Bluetooth technology and the creation of a low-power, low-bandwidth network between users in close proximity to one another. 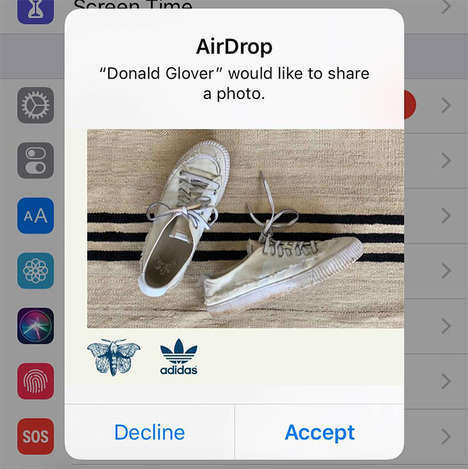 At Coachella, Glover is randomly requesting to share an ultra-exclusive AirDrop with festival-goers, giving them the chance to get a pair of the sneakers before others. The Childish Gambino adidas sneakers take the form of the lightweight, breathable canvas Nizza style with frayed details and a worn-in look that matches Glover’s laid-back approach to style. While many people often experience a fear of missing out by not attending large events like Coachella, this experience will have sneaker fans kicking themselves for not having their Bluetooth on.